We have had a GREAT year when it comes to rain and runoff to fill the pond! We anticipate stocking the pond this April, 2019. Our fishing policy will change moving forward, and fishing will be CATCH-AND-RELEASE only. Beginning this year, fishing is free for kids 12 years of age and under and they must be supervised by an adult at all times. The fishing charge for adults and kids over 12 will be $5.00 per day. 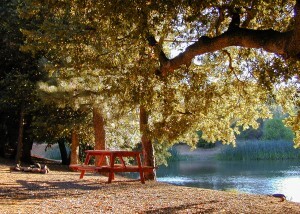 Imagine a lazy day spent with your son or daughter on the edges of Pinezanita’s fishing pond! Many a memory has been created when father and daughter, or father and son have caught their first fish while fishing at Pinezanita RV Park and Campground. While Pinezanita is not a world-class fishing location, several generations of fishermen have created and enhanced family traditions along its edges. The pond is strictly for fishing (sorry, swimming is not allowed) and we keep the pond regularly stocked with blue gill and catfish. The pond covers about an acre and a half and is surrounded by trees. The color of the water is red like the clay soil that is rich in iron. The color has been greenish-red at times, but on the whole it is “muddy” colored and never clear due to the clay suspension in the water that never “settles out”. 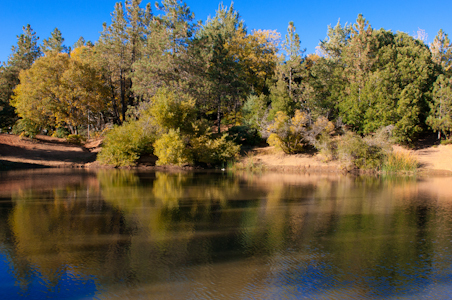 Several prime tent camping sites overlook the pond. Fishing is permitted with a small fee. Assorted tackle and bait can be found at Pinezanita’s Registration Office for catching even the shyest of fish. To assure a quality experience at the Fishing Pond, we require an adult to accompany children under 12 years of age. Pets are welcome as long as they are quiet and remain on a leash an out of the water. NO THROWING of any objects into the pond. Children under the age of 12 years are NOT allowed near the lake without adult supervision.